Home > GPS Personal Tracking Systems > Tracking Device Multiple Use AVL Tracker Free Ground USA Shipping! TrackingTheWorld's AVL-300 vehicle tracking device offers multiple options and outstanding durability. 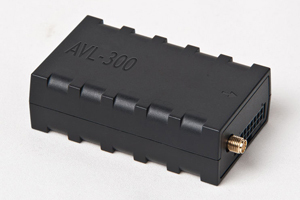 The AVL-300 tracker features both real time and passive GPS tracking options, two digital inputs and two analog inputs, including one that may be used as a third digital input. The GPS tracking device can be easily configured to communicate with a back-end server to provide emergency notifications, low battery alerts, geo-fence alarms, and more. The AVL-300 vehicle tracker is also compatible with Garmin Fleet Management Interface (FMI) protocol. Additional cables are required for this application. The vehicle tracker is also equipped with a built-in GPS/GSM antenna, and is compatible with optional external antennas. TrackingTheWorld's AVL-300 tracker is equipped with a UBlox chipset for faster time to first fix (TTFF) and greater accuracy, and eliminates problems caused by GPS jammers with a built-in jammer detection feature. For greater efficiency, the device includes a built-in 3D motion sensor for conserving power and the advantage of detecting motion of the tracked vehicle. The AVL-300 tracker is compatible with a wide range of operating voltages, from 8-32 V DC.